Whatever the answer, and whichever school of thought you prefer to follow, you can be sure that the foods to cleanse your colon that we will discuss in this article can only benefit your overall health and well being. Fiber comes in two forms – soluble and insoluble. Soluble dissolves in water, but insoluble does not. Insoluble fiber is a great aid to both preventing and getting rid of constipation, whereas soluble fiber helps to increase the amount of beneficial bacteria in your digestive tract. This in turn helps to minimize any harmful bacteria, the likes of E. coli and Salmonella. Some of the best sources of fiber (both soluble and insoluble) are Flaxseeds and Oats. Oats are great as a breakfast cereal made into porridge, whilst flaxseeds can be sprinkled over porridge, or yoghurt, fresh fruit or salad. For a list of other foods that are high in fiber, simply follow this link. Celery is also universally recognized as being one of the best foods to cleanse your colon. Like the Apple, it too is high in dietary fiber and easily portable as a snack, anywhere anytime. Another important fact about Celery is that it is one of the few negative calorie foods. In other words, your digestive system uses more calories to process Celery than are actually in the Celery itself. It’s great to include as part of any calorie controlled diet. The act of munching away on a stick of Celery helps your tummy to feel full, but with only 8 calories per stick, it doesn’t really impinge of your daily total calorie intake. Raw yoghurt is a natural probiotic, which, unlike many other yogurts is not pasteurized. The pasteurization process is designed to kill good bacteria. The problem is that it cannot discern between good and bad, therefore it is also responsible for killing off a high proportion of the beneficial bacteria too. Raw yogurt is very easy to digestive and is a great natural treatment for indigestion and heartburn. The good bacteria within the live culture supports the good bacteria in your colon, making it one of the foods to cleanse your colon by helping it to overcome the bad bacteria. It is believed by many to not only help and clean your colon, but also to be beneficial in helping to be able to prevent colon cancer. One of the universally acknowledged benefits of aloe Vera is its ability to help to wash out any toxins from the colon and the digestive tract. It is believed by many, that if left in the colon, these toxin residues can induce tiredness, lack of energy, and frequent headaches. In addition, Aloe Vera is also believed to act as an effective boost to the immune system, and to also be influential in helping to prevent colon cancer. Garlic is another one of Mother Nature’s miracle herbs. It contains nearly 80 different compounds of sulfur which are able to promote healing and fight infection. It also contains a substance called Allicin, and this helps make garlic a natural alternative to pharmaceutical antibiotics. In World War I it was actually chopped and put onto the infected wounds of injured soldiers. Garlic also has the ability to kill intestinal worms, parasites and viruses that live within your colon. In addition, Garlic is said to be able to reduce bad cholesterol and increase good cholesterol. It is also attributed as being able to help prevent the onset of some cancers, including stomach and colon cancer. If all that’s not enough, it is also plays an important role in helping to lower blood pressure. Fresh garlic can be added to many cooked dishes for distinctive, added flavor, but if the flavor or aroma disagrees with you, it can be bought in supplement form at most good health-food stores. 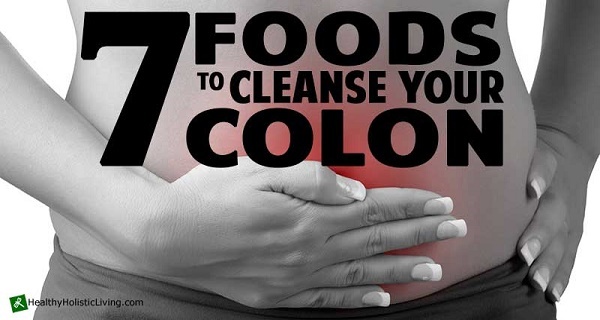 The jury is still out as to whether you really do need to naturally cleanse your colon. However, the one thing you can be certain of is that eating any or all of the above mentioned foods will be good for your holistic health lifestyle in any event.